PMB-Präzisionsmaschinenbau Bobertag GmbH was founded in 2008 in Kaiserslautern. Since then, the company has achieved a leading technological position in the field of ultra-precision balancing with its own UMS measuring systems, self-developed software and its complete CAROBA® Balancer balancing machines. PMB offers its customers the highest quality in balancing technology from micro fans to large gears and from individual parts to large series. 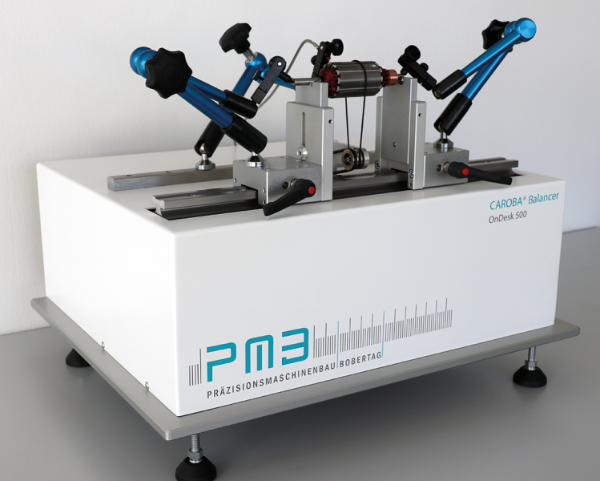 PMB machines and systems achieve residual imbalances of less than 0.001 gmm, depending on the balancing object and process. Different balancing machines are available for different customer requirements. The spectrum ranges from small, flexible worktop models of the "OnDesk" series to larger "Universal" systems with protective cover, operating terminal and integrated measuring technology. For special requirements, systems are available, e.g. for removing the unbalance mass using laser technology. In this way, the company makes an important contribution to the quality of customer products and contributes to their success. PMB advises on all aspects of balancing, supports in planning and implementation with its experience from a wide variety of tasks. Excellent service, competent advice, regular software updates and maintenance contracts enable customers to achieve a high level of production reliability over the entire life cycle of the machines. The program is completed by our own contract balancing center. Not only are customer parts for small series, large series, research and prototype construction balanced there, it also serves as a constant input for research, further development and the testing of new balancing techniques.